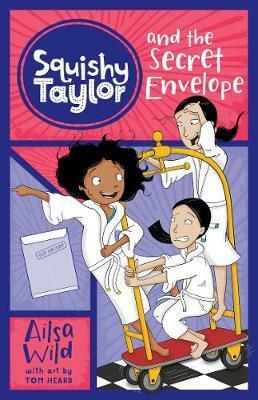 Sita `Squishy' Taylor is a cheeky, sneaky 11-year-old who lives with her dad and step-family in a very crowded apartment. Luckily for Squishy, their building is huge … and there’s always plenty of mysteries to investigate! What’s the best thing about hotel swimming pools? Can you live in two different places at once? How do you hide in plain sight? How do you make the biggest choice of your life? Australian superstar Squishy Taylor is a curious, likeable and instantly relatable hero for ALL kids aged 6 and up. She’s part of a blended family - a new kind of normal for so many kids, whether it’s a Modern Family or more of a Brady Bunch. Between nightly Skype-chats with her mum, dealing with a noisy baby or her two new `bonus sisters', there’s always a new challenge or exciting mystery to solve. Squishy Taylor and the Bonus Sisters (#1) was listed as a Notable Book in the 2017 CBCA Awards, and was shortlisted for the 2017 Readings Children’s Book Prize. Squishy Taylor and the Tunnel of Doom (#6) was shortlisted for the Wilderness Society’s Environment Award for Children’s Literature in 2017.